Submitted by witness on Wednesday, December 4, 2013. OBSERVED: Foot print found 12-4-13. 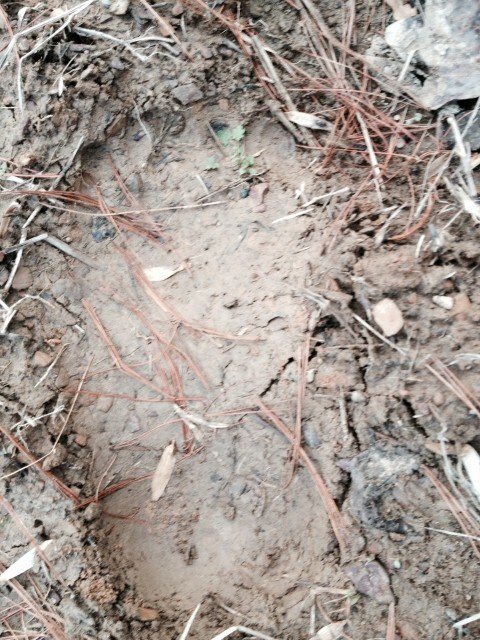 Wife had sighting 2 months before we found tracks today. Bigfoot has been in this area and active for the last few months. OTHER STORIES: Yes people claim to have seen something over the years. I think they think we are crazy, however we know what we saw. ENVIRONMENT: It was close to the house, it is a community here and is not concerned about houses. I met with the couple on 12/8 for over four hours at their home and found them to be coherent, sincere and consistent with their accounts. Between my visit and phone calls, I’m convinced they are truthful. The witnesses first became aware of the creature at 1am on a full moon night in October 2013. Mrs. X heard their two small dogs barking, so she went onto the back deck and watched the two dogs run toward a pack of barking dogs running up the road toward her house. She then started hearing the thump, thump, thump coming from a dark, upright, huge figure slowly running on 2 legs up the middle of the road with the pack of barking dogs keeping pace 10 yards back. When the creature got to a patch of dense woods, about 50 yards away from the witness, it stopped, squatted down until its hands touched the ground, sprung back up while spinning around to face the dogs, and let out a very loud, growling screeching scream with its arms out. Mrs. X gasped and said, “oh my gosh” aloud. The creature turned to face her, then turned to the opposite direction and walked straight into the dense undergrowth and woods. The pack of dogs followed, but her two dogs returned when they saw her on the deck. The witness also has a Great Dane and it leaned against the gate with its hair bristled the entire time not allowing Mrs. X to go after the two small dogs when she first stepped outside. The next notable occurrence was in their chicken coup. Two 2x4 cross members holding the chicken wires at the top, about 8 feet off the ground, were ripped down, and their two chickens were on the ground with their necks broken. Also, many of their caged quail located in the same barn have disappeared over time at night from an enclosure which requires hands to open. The cage is always shut the next morning. The second sighting occurred on November 2, 2013 around 4:45 PM, about one hour before sunset. Mrs. X was closing the back doors of their barn when she thought she saw movement in the woods downhill in her peripheral vision. As she was shutting the second half of the doors, she caught sight of movement again. She looked up straight at a creature, estimated between 7.5 and 8 feet tall, which froze staring back at her from 110 feet away. It was facing her. She estimated the weight at 450 lbs. The shoulder width was estimated at 3 feet. 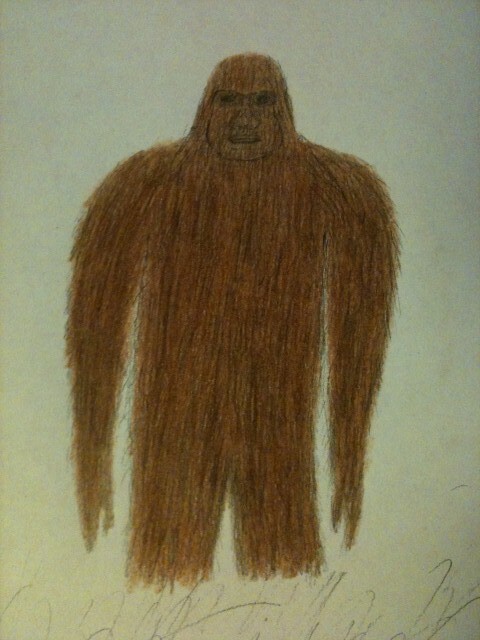 It had dark brown hair, with an orange tint, covering its entire head and body from 2-4 inches long. The face was completely covered with short hair of the same color. The legs were slightly apart. The feet were out of sight because of the curvature of the downhill slope. The arms were hanging straight down with human like hands. The creature quickly turned to its left and bounded diagonally away down the steep hill with long, straight-legged hops similar to what a deer might do. The arms were swinging right foot and right hand forward, left foot and left hand forward. The stride was 6-7 feet from the measurements Mr. X took in the leaf litter. The sounds went out of sight, over a 4-foot fence, and on down the very steep hillside out of hearing range. This sketch below depicts approximately what the witness saw before the creature fled. With both sightings, the wife said the creature behaved as if it was more afraid of her than she was of it and that she believes it was the same creature. Dermal ridges were present on one of the casts. A set of small deer tracks were also present. The track casting took place at night, just as rain moved in. A rock was thrown and landed less than ten feet from the couple and the print being cast at the time. There was also banging on the back side of the barn while casting (where the second sighting took place). Afterwards, it was noted that the newly installed, tight chicken coup wire had been stretched in a spherical shape about 18” off the ground. It was still stretched tight and flat before the casting started. One of their new chickens was rousting in the rafters instead of their normal rousting place which had never happened before. The impression in the wire was made by something at least as big as a basketball. I got down on all fours and pushed my head into the spherical impression. I found I was looking through an 18” opening in the barn wall straight at where the tracks were being cast. Screams and howls have been heard for several months. The witnesses have had responses to provocation sounds as well. The witnesses live in a rural area about two miles south of the Bankhead National Forrest. Travel to the National Forrest from their home can be made completely through the woods with only two road crossings. There is about three square miles of woods and rough terrain both behind and across the road in front of their home. These six square miles of woods are a mix of hardwood and evergreen private land with mostly no hunting. All signs of activity ended when deer season ended. Nearby Bankhead National Forest is heavily hunted. It is my belief Mrs. X saw a Sasquatch twice and they most likely had a juvenile leave tracks. I also believe they were observed and harassed by a Sasquatch while casting.